Good Monday morning!!! Got back yesterday from a little trip to the beach and boy was it great!!! So relaxing and fun. But now it is back to work and challenges. Today starts the new challenge at Exploring Cricut and More. Our theme is Happy Birthday and must include something sparkly or glittery. Since our daughter-in-laws birthday is this week I decided this was the perfect time to get her card made. This beautiful flower is from the Silhouette Store. It is by Miss Kate Cuttables and is file #64233. I sized it up, but not sure of the measurements. I thought I had guessed just right for an A2 card, but I guessed wrong. So I made a 6x6 card instead. I added some seam binding that I crinkled and dyed. Also some Bubblegum sequins. I brushed the dark edges of the flower and buds and the dark part of the leaves with a Clear Wink of Stella brush to give it a sparkle. I then popped it on one thickness of foam tape. 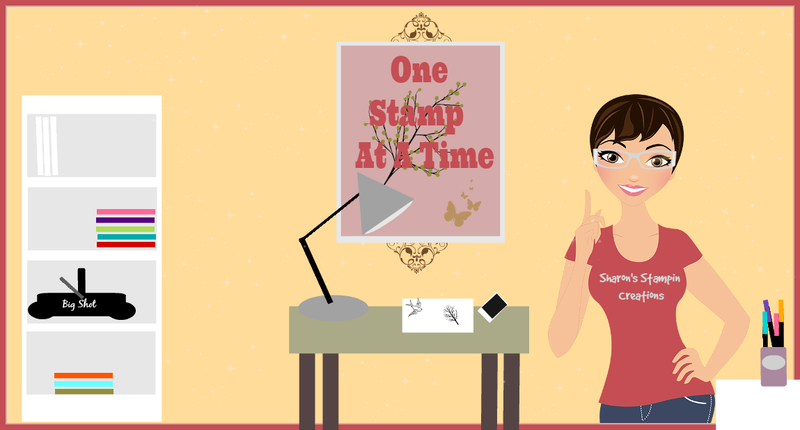 The sentiments are from the 'Build A Birthday' stamp set by My Craft Spot. Head on over to Exploring Cricut and More and check out the projects that my DT Sisters made. Awesomenss for sure!! Check the sidebar for the rules to our challenges and then head to your crafty space and create a Birthday project with some sparkle or glitter. Can't wait to see what you make. You will have until 10pm, EST, Saturday August 30th to link your project. Totally love this card and I do not think I have used this cut yet. Fantastic job!!!! How beautiful! 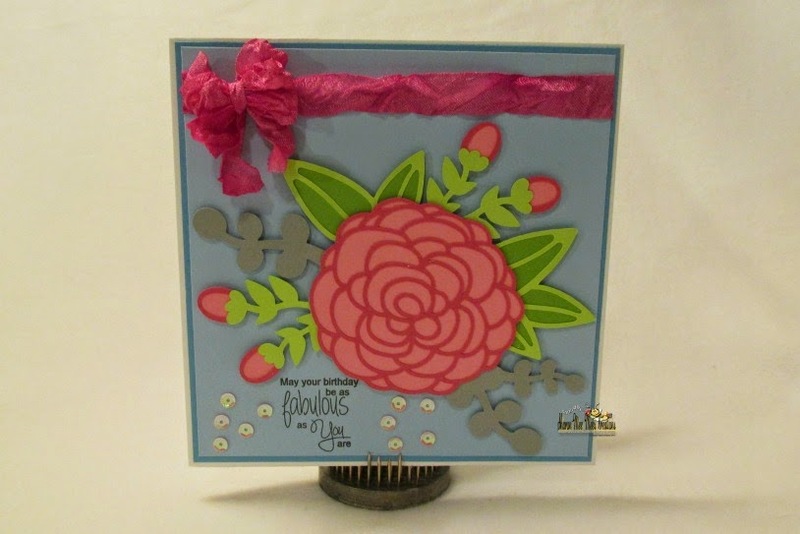 Love that flower & ribbon-great job! So pretty! I love the inside of the card! I just watched a tutorial on making crinkly ribbon. 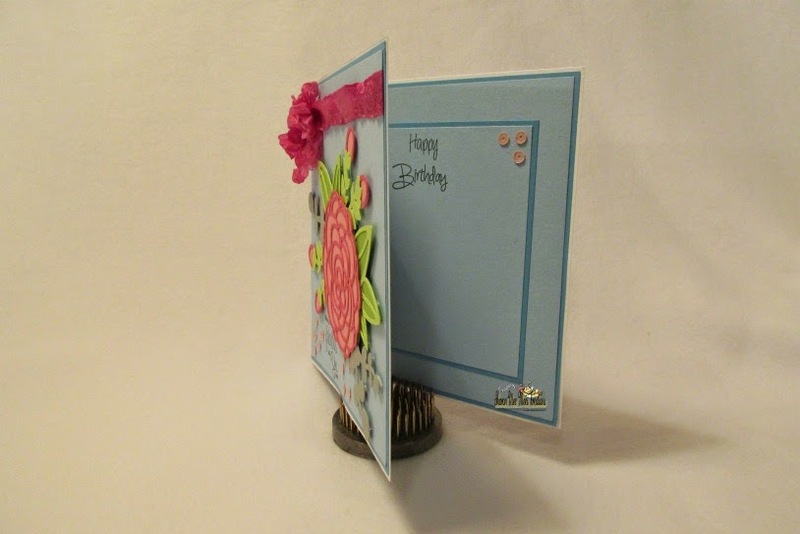 I'm inspired to try this; it looks great on your card! Wow on the ribbon-such a pretty color you dyed it! This feels so fresh and colorful-love it! Beautiful card. Love the flower and the ribbon. The inside looks lovely too. What a beautiful card! I love that gorgeous flower, the colors are so pretty. The beautiful bow and fun bling are perfect embellishments - just lovely! I am a child of God. A Daughter, Wife, Mother,(2 Children and 2 Children-In-Laws), and MeeMee to nine Chickadees and to greats!! My DH and I have 3 dogs. One of our furbabies is a short haired Chihuahua named Angel who is almost 13 years old and has been with us since she was 6 weeks old. We have two Bassett Hounds that DH named King Tut and Cleopatra. They came to us when they were eight weeks old on March 24th, 2018.